Meadow Sage | Decorative and a Magnet For Hummingbirds and Butterflies! The herb known as salvia pratensis, or meadow sage, is a perennial that grows wild in Europe, parts of North Africa and across western Asia. In this century (and last) it has become a common sight in North America, and was considered a weed for a long time. Today, horticulturalists are appreciating its value as a flower and as a herb. Note: Apparently it is still considered a weed in Washington state and it was once banned in California! The name comes from the fact that this pretty herb is most often found growing in meadows, although it can also be found along the edges of a forest as well. Meadow sage is a bushy shrub that can grow to nearly 3 feet in height (about 1 metre). The leaves are a rich shade of green with some greyish tones, with ragged edges, and four to six flowers grow on each stem. The flowers are small, less than three centimetres in length, and come in many shades of blue, pink and purple, ranging from deep vibrant colours to pure white. Like all varieties of sage, the leaves of this meadow type are pleasantly fragrant when you crush them. Whilst it does bloom early, it will continue to flower all summer long if you remove the dead blossoms. Another great reason to plant it is that it acts as a magnet for hummingbirds and butterflies. Note: I've never grown this variety, but if you click here, you can get general growing tips for the more common varieties. 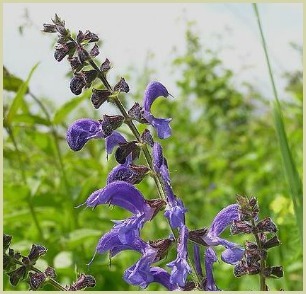 In ancient times, it was used to help promote eye health and is sometimes referred to as meadow clary. The name “clary” comes from the term “clear eye”. It was also used as a flavouring for beer and often used to make a tea, where it was used to soothe sore throats and promote healthy gums and teeth. Click here for a tea recipe. Bog Sage - Horrible Name But Lovely Flowers!